Known best in French cooking, leeks are often overlooked in our home gardens. Leek Potato Soup, or vichyssoise, is a cold soup that every French chef has mastered. I use leeks in potato leek soup, three onion pie, and vegetable soup. Leeks are expensive at the grocery store but you can grow them for pennies. They take up little space, have very few pest or disease problems and can be grown in containers. Plant leeks deeper than onions. Continue to mulch plants as they grow to increase the tender white part. Grow leeks from seed or starts. It will probably be your first late-winter or early spring crop. Onions, leeks, garlic can take a late snow or freeze. Tender young leeks can be used as scallions or green onions. Plant starts deep er than onions. The deeper, the better able to retain moisture. Select well worked soil with plenty of organic matter. As leeks grow, continue to mound soil over the stems to blanch them, creating more of the white, tender part of leek. Consistent moisture will encourage tender leeks. Thin leeks to grow six inches apart. Use only the tender green and white parts. Grow your own soup. 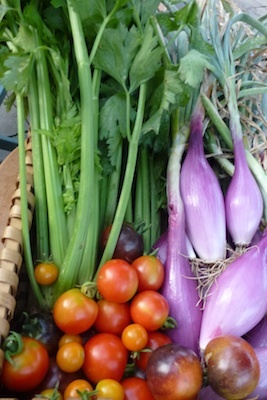 Garden fresh vegetables are loaded with nutrients and cost very little to make. If you don’t think you have time to make soup, make a double batch and freeze half for a busy day. Make soup in the crock pot. Soup usually tastes even better the next day. What could be faster than that? Chili, chicken and noodle soup, vegetable soup and stews of any kind are better and usually have less salt when made from scratch. I love soup and will be sharing some soup gardening and soup making tips from time to time. Jazz up your favorite potato or cauliflower soup recipe by adding leeks. Potato soup is a winter time favorite of mine. The leeks in the garden will continue to grow and I will pull them as I need them for Potato Leek soup. Simply add leeks or replace the onions in your favorite potato soup recipe. I make this big batch because this soup is even better the next day. You can make half this recipe, but I bet you will wish you made more. Makes about 8 servings (about 2 quarts). In a large sauce pot, cover chopped potatoes and carrots with water. Cook in water until fork tender. Drain and set aside carrots and potatoes, reserving cooking water. In a Dutch oven, while potatoes are cooking, saute onion and celery in butter until tender. Sprinkle in flour. Slowly add milk. Bring to gentle boil, stirring until thickened. Add carrots and potatoes, salt and pepper. Gradually add cooking water until the soup in the desired thickness. Taste and adjust seasonings. For smoother soup, use a potato masher or stick blender. This will thicken the soup and create a smoother texture. Add additional cooking water or milk to taste. Grate a little nutmeg to garnish soup. Potato and Leek soup with kielbasa. Top your soup as you would a loaded baked potato, crispy bacon, grated cheddar cheese, green onions, a dollop of sour cream or a pat of butter. Bake: Use baked potatoes instead of boiling potatoes. Herbs: Stir in chopped parsley, celery leaves, chives or thyme. Enrich: texture and flavor with 4 ounces of sour cream, plain Greek yogurt, cream, butter. Add a little at a time. Chop tender young leeks to freeze for soups and casseroles. If you do not like onions, try leeks. They are milder and easier to digest. These mild alliums are beneficial for cardiovascular and digestive health. Research points to leek’s potential to fight cancer. Made from scratch and better than the mix. Add Cheddar, onions, peppers for color and flavor. While you have a garden bounty, make two loaves and freeze one for later. I make this beer bread using the peppers and onions from my garden. Make this recipe your own. Use your favorite cheese, whatever beer you like and any pepper combo that suites your palette. Whisk together in a large bowl, flour , baking powder, salt and sugar. Add cheese peppers and onion. Pour in the bottle of beer. Using a wooden spoon, mix until the dough forms. Don’t over mix. Dough will have lumps. Pour dough into a heavily buttered large loaf pan. The dough will be wet. Melt butter, pour over loaf. Bake for 50 – 60 minutes, until top is golden brown. Or, until toothpick comes out clean from center. Let it cool 10 minutes and then turn the bread out on a wire rack. Try to let it cool before devouring. cheese – Choose your favorite cheese or combination of cheese to make ½ cup. onions – Your choice of sweet or hot onions. I include a green onion or chives for color and flavor. You will want to eat this bread still hot from the oven. It’s good that way, but it will crumble and fall apart. To slice and serve, wait for 30 minutes (or, until completely cool). 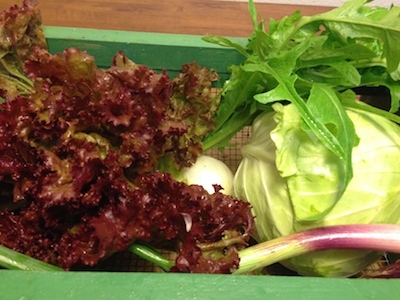 It is a joy to still have a variety of lettuces and beautiful salads from the garden. I just step out the kitchen door, and across the drive to my kitchen garden. We call the vegetable garden the circle garden because it is the interior of a circle drive. The space was originally full of rocks and trash. 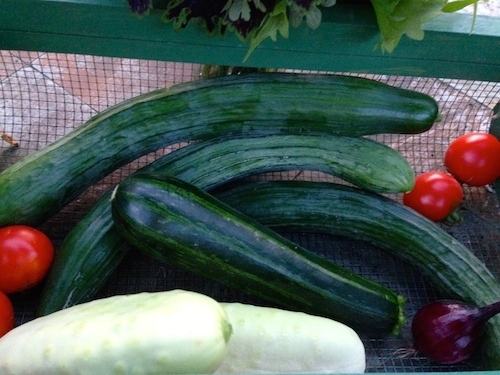 With a lot of time and work, the garden had become very productive. You can find plenty of earthworms in each of the raised beds. I planted four little cabbage plant stars in four different places in the garden this spring. 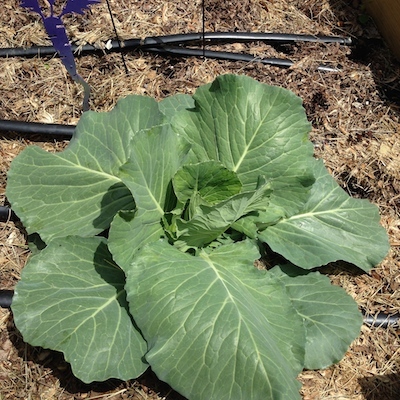 My hope was to raise a head or two of cabbage before the worms and slugs moved in. Because I don’t spray, cabbages and broccoli are always a disappointment. But this year, one of the cabbages just seemed to be bug proof. It amazed me so that I took a photo of the big uneaten cabbage leaves. 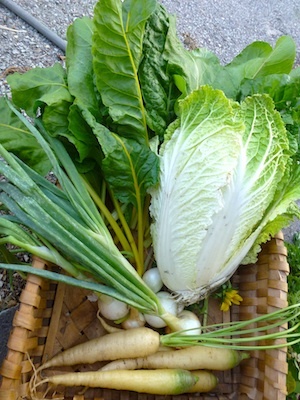 The cabbage in Today’s Harvest Basket will become cole slaw. I make it with a vinegar dressing and not the one with mayonnaise. Shred veggies, toss in large bowl with dressing. 1 small head of cabbage, finely sliced. “Garden Ferns” leaf lettuce is juicy and still producing. This tender lance shaped leaf lettuce is an excellent addition to any salad. “Redina” organic, French Red Leaf lettuce. Very large rosettes of frilled & ruffled deep red leaves. I get these beautiful leaf lettuce seeds at Renee’s Garden. The celery should have been picked weeks ago before the big heat wave. But even the bugs and disease ignored the celery. So sometimes, even when you do everything wrong, garden plants will thrive anyway. This was the last of the onions in the garden. 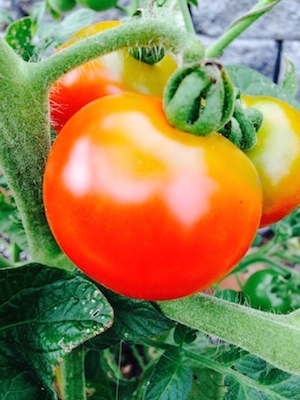 A few saladette tomatoes, the Indigo Rose tomatoes are ripe every day. I’ll make cole slaw out of the cabbage. It is a lighter version of slaw. I never make that mayo based dressing any more. The chard will go into green rice.